These accessible commentaries are for anyone who wants to enter a serious study of God's Word. Each volume guides the reader through the literary and theological issues in the text and provides correlation to multiple numbering systems for word study. 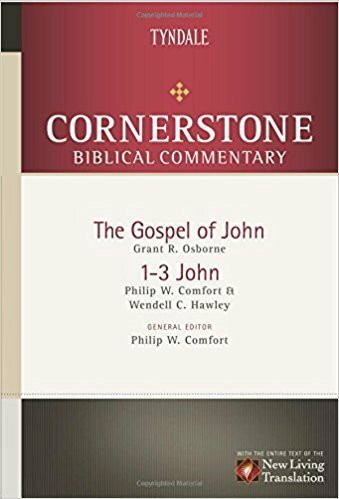 This volume includes the entire NLT text of John and 1–3 John, translation notes, and fresh expository commentary. Dr. Philip W. Comfort has studied English Literature, Greek, and New Testament at the Ohio State University and the University of South Africa. He has taught at Wheaton College, Trinity Episcopal Seminary, and Columbia International University. He currently teaches at Coastal Carolina University and is a senior editor of Bible reference at Tyndale House Publishers. Dr. Wendell C. Hawley graduated from the University of Oregon (BA and MA) and from Western Baptist Seminary. He was awarded the LLD from California Graduate School of Theology and the DD degree from Western Baptist Seminary, Portland, Oregon. Dr. Grant R. Osborne is professor of New Testament at Trinity Evangelical Divinity School. Prior to his work at Trinity, he served as a pastor for over 4 years and taught at Winnipeg Theological Seminary and the University of Aberdeen. He received his Master of Arts in New Testament from Trinity Evangelical Divinity School, and the Doctor of Philosophy in New Testament from the University of Aberdeen, Scotland.